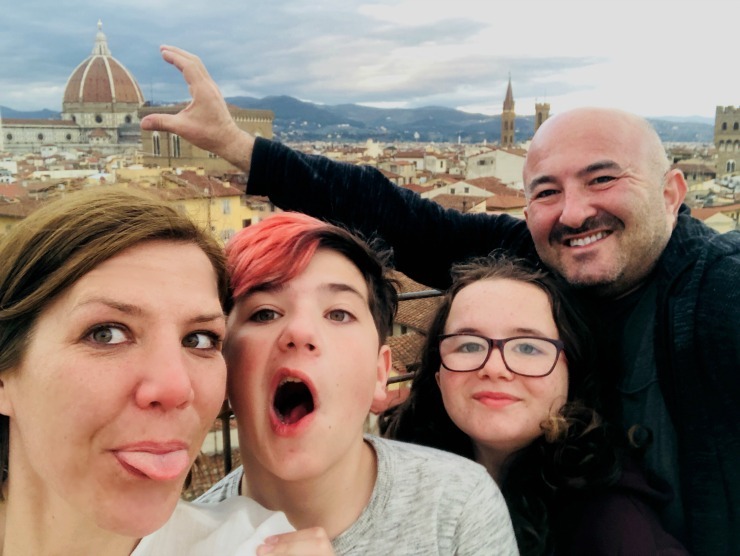 After spending a couple days at that dreamy spa in Tuscany we drove right into the middle of swarms of tourists in search of fun in Florence, Italy. And I wanted to turn the car around and go back to the serenity of Tuscany. We were staying right in the center of it all, about two blocks away from the famous Uffizi. This was an error in both judgment and not being informed on how insane this area can be. We could barely drive our car down the street to get to our hotel because it was so packed with people! 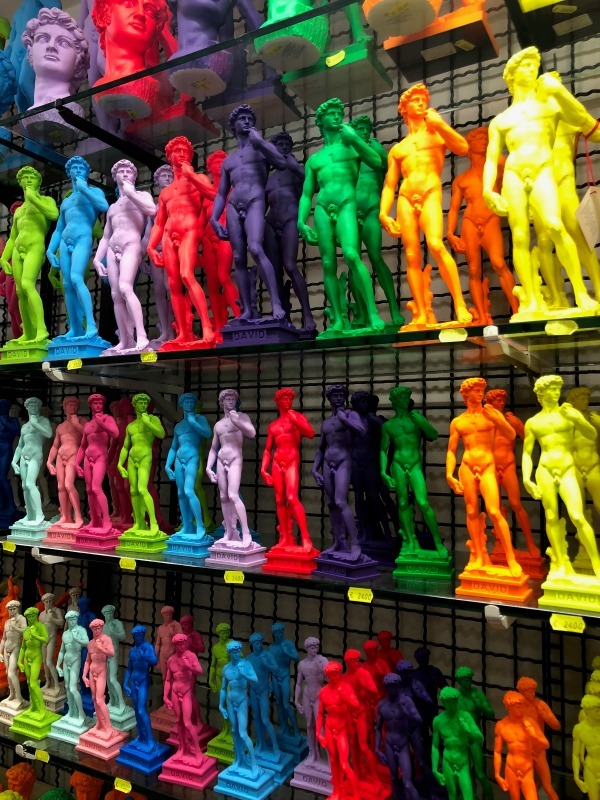 This is also what you get when you visit Florence the week of Spring Break. But we were told by several people that Florence is like this ALL the time. 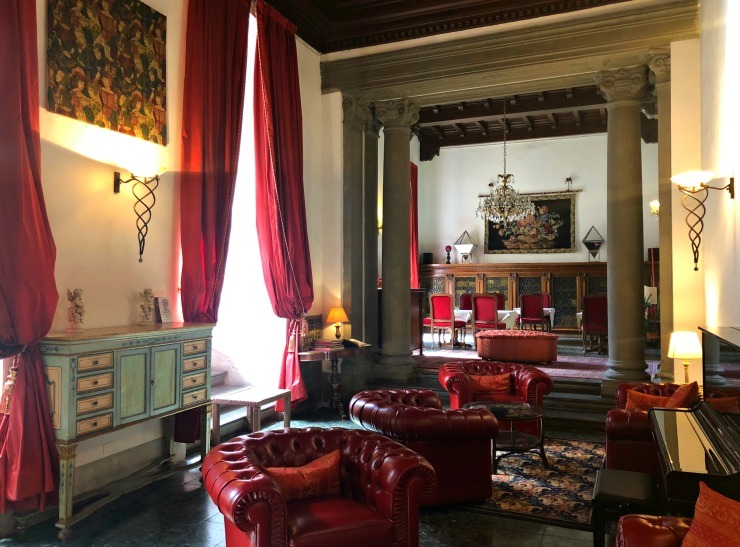 Similar to Venice, we stayed at a historic palace dating back to the 12th century, Hotel Torre Guelfa. I love staying at these unique hotels, they always have interesting quirks to them. It makes me embrace the destination more. I didn’t even recall deciding on this hotel, so it was a pleasant surprise to me that there was a tower that lead to a roof top terrace! 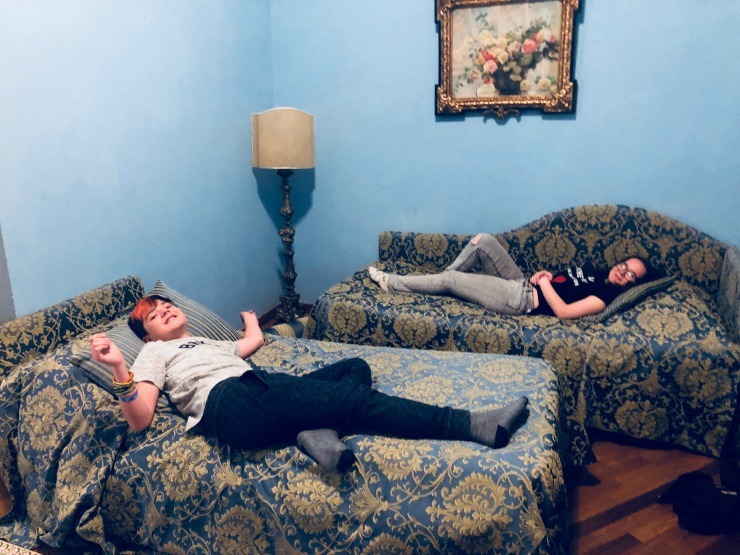 We checked into the “green room.” While I was sitting in there with the kids while Harris was bringing up the rest of the bags, I literally felt claustrophobic and nauseous. The green walls were literally closing in on me. When Harris got to the room, I was like um, Harris this room is making me sick. So, this is something I NEVER do, but I was like, we have to change rooms. So Harris went to see if any other room was available and lucky enough a larger room was, and so we upgraded to a suite that was not only was it a better color (blue), but it was much bigger, had a separate bedroom, a much larger bathroom, a huge window and even a small terrace for us to sit out on. Thank goodness we asked! 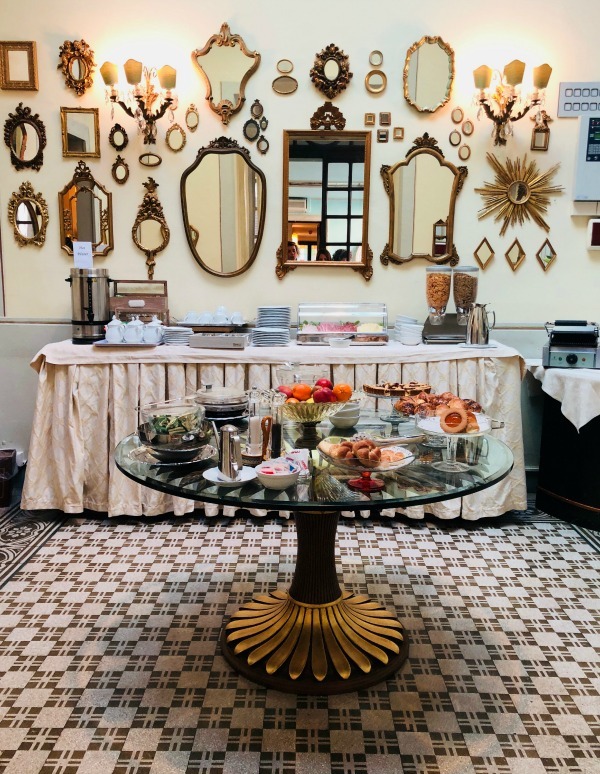 I loved the little breakfast room at Hotel Torre Guelfa. They also had a huge sitting area on the 4th floor. This is where you could climb the 72 stairs to get to the rooftop terrace, which had the most incredible 360 degree views of Florence. Florence did not thrill me. I just did not jive with Florence, at all. Yes, there were a ton of tourists, which is always frustrating. But I’ve been in touristy places before obviously, so I can look past that. It was something else, it just didn’t do it for me. This might be because I am not a huge museum person and I think the Renaissance is a total snoozefest. 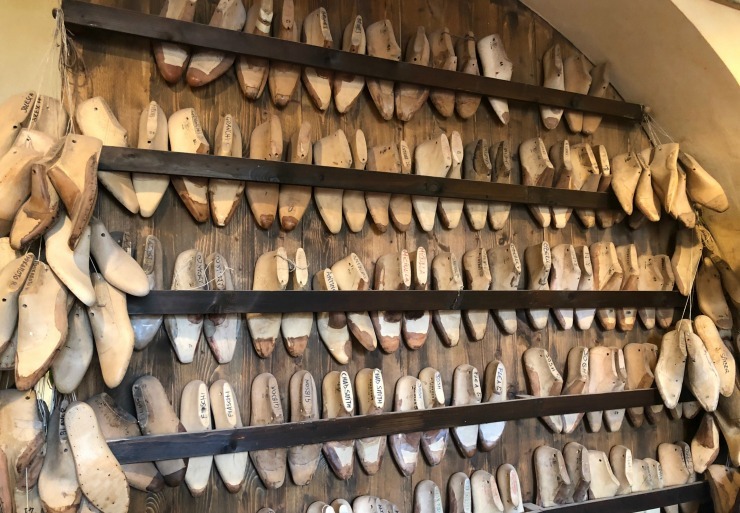 I also didn’t need to buy any leather goods that are sold all over the place nor did I need to buy jewelry that fills the entire Ponte Vecchio Bridge. 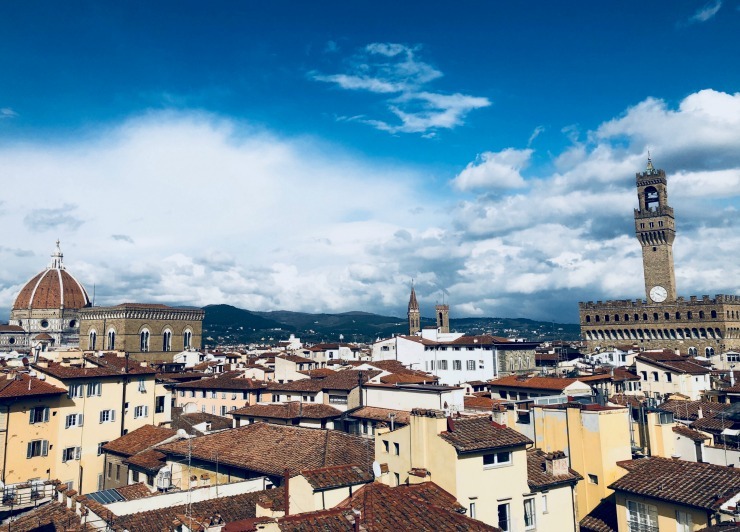 But rather than spend more time telling you why I disliked Florence, I’ll share with you how we found our fun and the few things I absolutely LOVED. After walking around all day with gobs of people (and me being unimpressed), we all agreed that we just really wanted to go buy some drinks and snacks and go back up to the rooftop terrace to sit and take in the beautiful view, so that’s what we did. 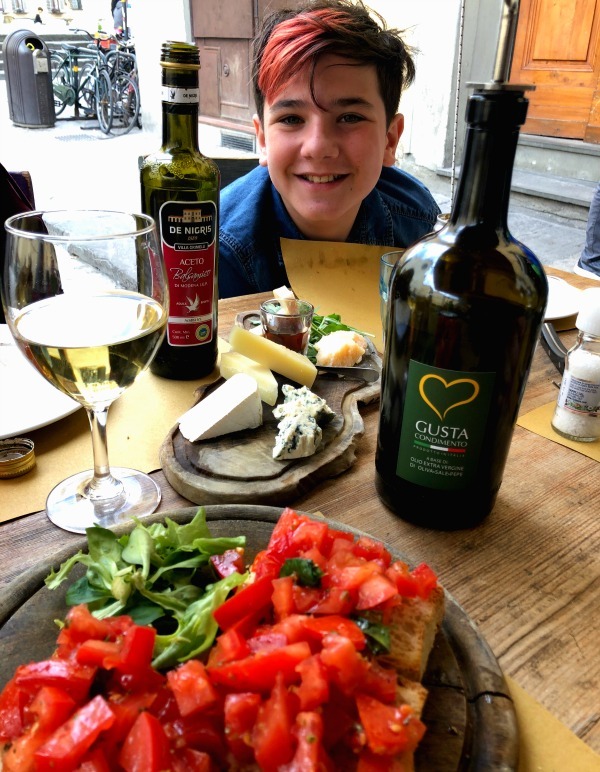 We enjoyed some of the cheese that we had bought on the way to Florence, and it was probably my favorite thing we did. *You do not have to be staying here to go up to the top of the tower, so find your way here and take in the incredible view! Harris and I let the kids stay back at the hotel and when we walked to dinner. We turned the corner and we saw the most incredible view of The Duomo. 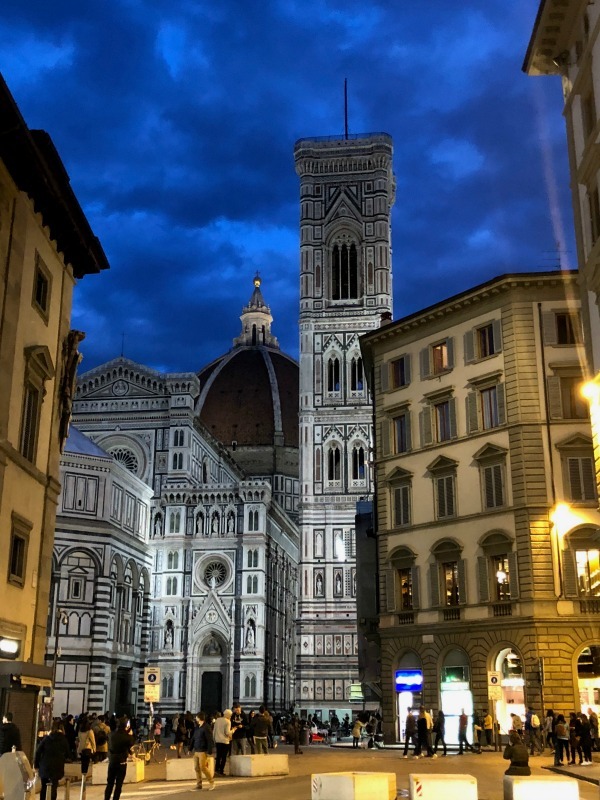 This particular night the sky was doing some amazing things, and it made the Duomo look like a cardboard cut out! The Duomo is pretty impressive, but not the dome everyone sees in photos, the rest of the building. 3. The most amazing spaghetti ever! We found this nice little square near the Pitti Palace and actually ate at two different restaurants here. Both times our food was great! But the showstopper was this insanely delicious spaghetti at Gustapanino!! The bruschetta at both places was fantastic as well. Borgo Antico is a restaurant right next door and the food there was excellent too. I highly recommend going here to sit outside in the sun and have a great meal. 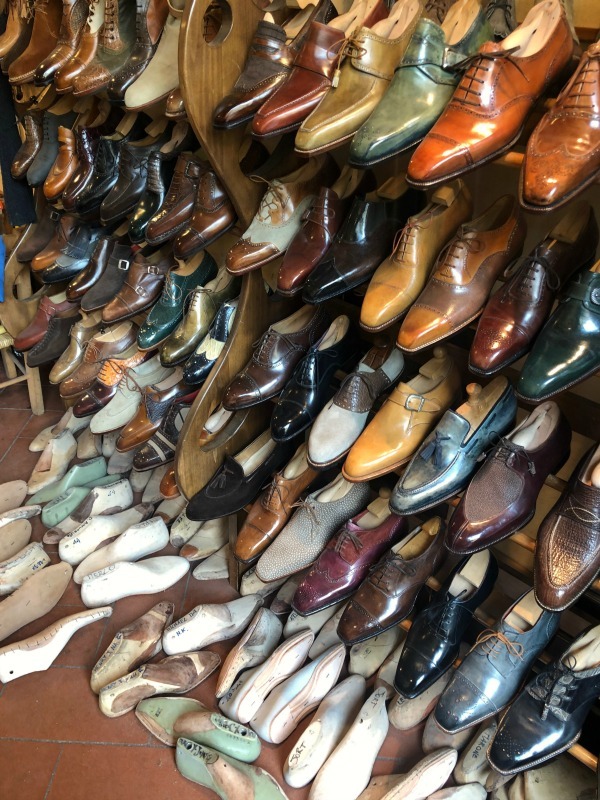 Right around the corner from the best spaghetti in the world is this shoemakers shop. I stood and watched this cute guy make shoes. 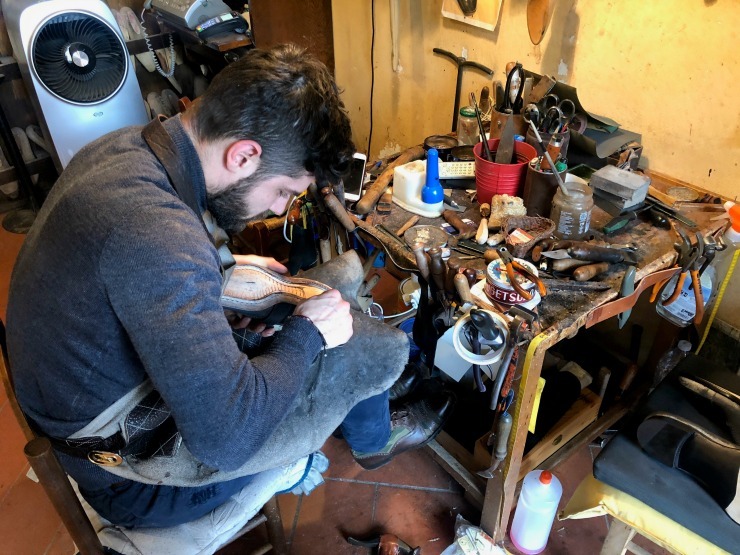 The amount of work that goes into making a pair of shoes was mesmerizing. The folding, cutting, stitching, trimming, carving and pounding. It was such a cool thing to see. 7. Finding this awesome photo booth! 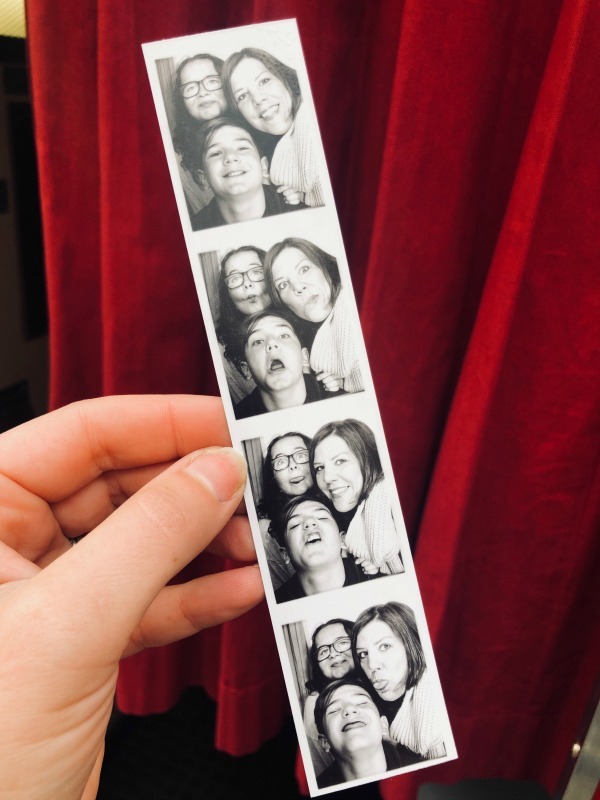 The kids and I were on our way to our Airbnb Experience to make pasta and found this cool photo booth. Obviously, we had to take some photos. I LOVE our photos so much! I never seem to get in any photos, so this makes me happy. And it’s perfectly retro. 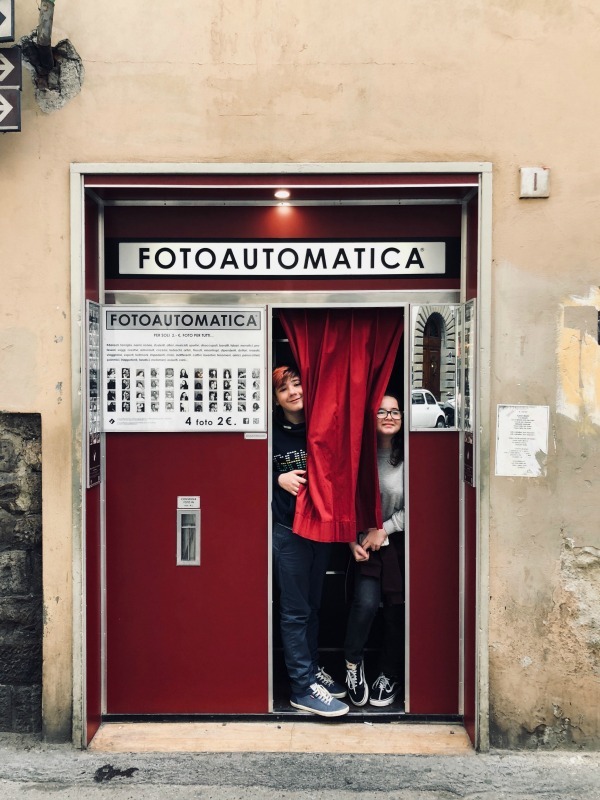 Right next to this photobooth is a very cool bakery, S. Forno. You should go here for a coffee and a pastry or to by some bread and other goodies! 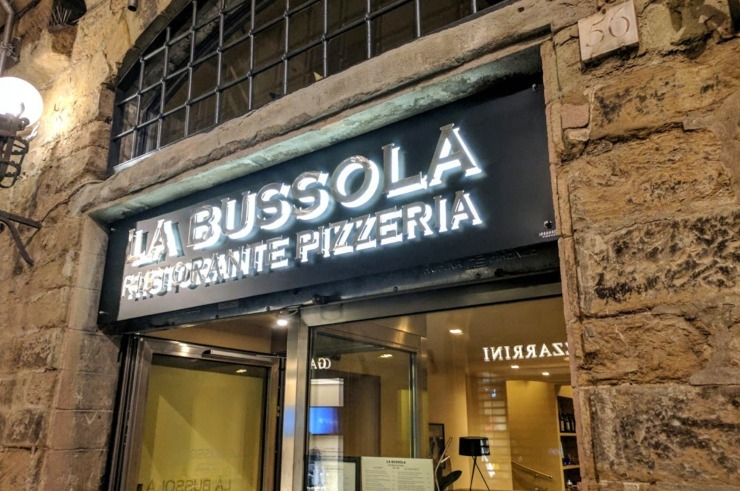 They also have a restaurant http://www.ilsantobevitore.com/. I never cook, so why not go on vacation and give it a try. 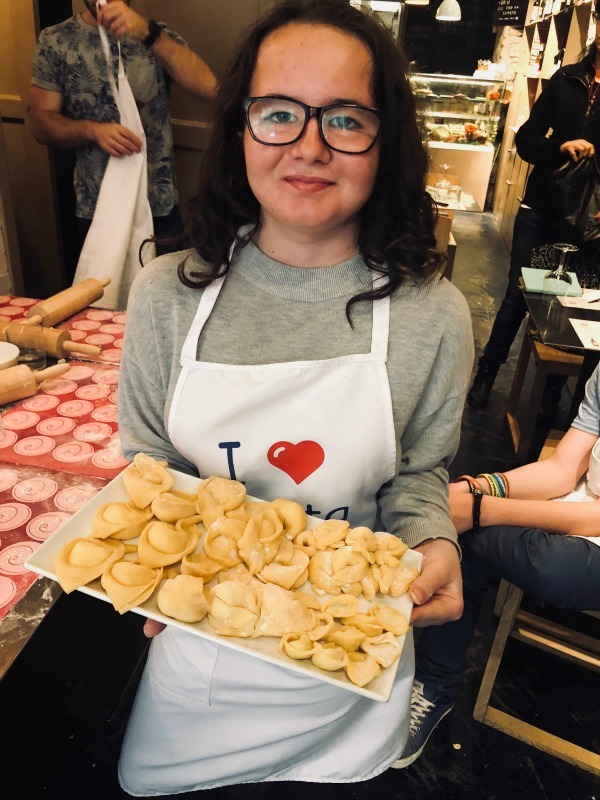 I wanted to do something in Venice or Florence that would give the kids some hands on learning or at least a new experience. When I saw this Pastamania experience offered on Airbnb I thought it might be fun. McKenna is a “pastaterian” because she’s a vegetarian and eats so much pasta, so this was really for her, but Hudson had fun too! I really enjoyed the experience and I would recommend it to other families. Pastamania was hosted at a restaurant called Vivanda You should make a reservation to eat here. Florence has a thing with stationary, marble paper and paper goods, who knew!? 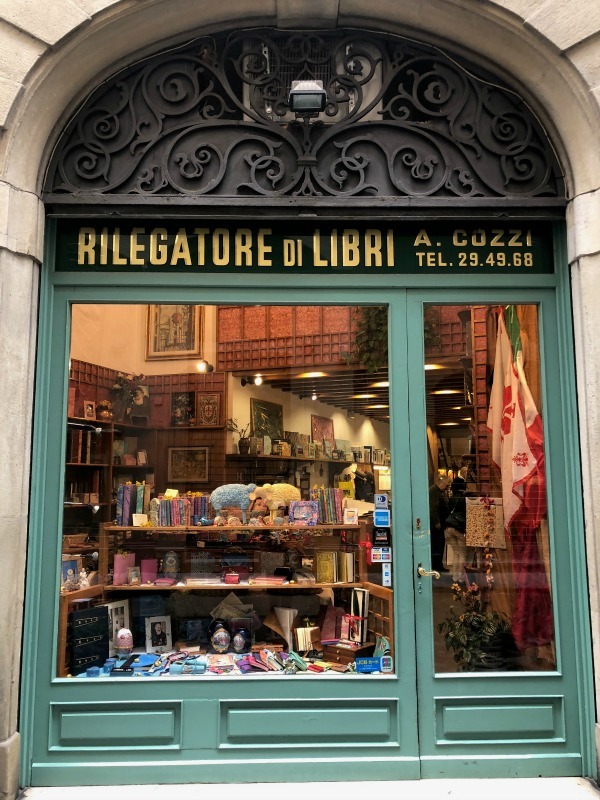 This shop Alberto Cozzi was a gem of a find right on the same street as our hotel. It had wonderful little gifts, leather notebooks, beautiful cards, stationary, paper and all sorts of goodies. 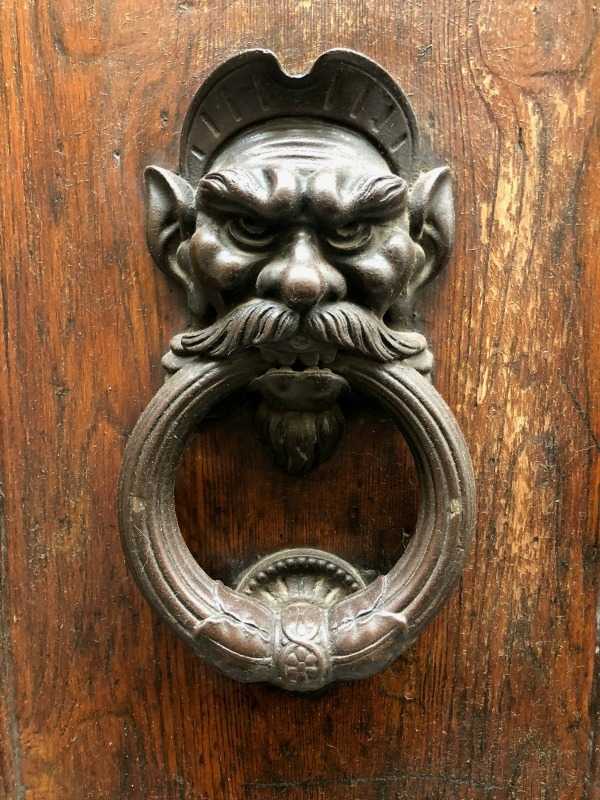 The architecture in Florence didn’t impress me, but I loved the door knockers. 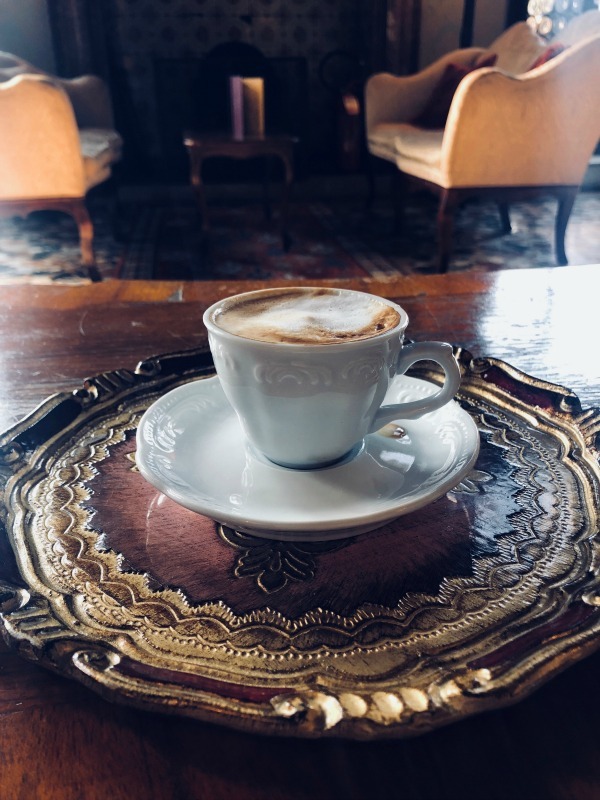 I did not know about Florentine wooden trays until I was in Venice and our hotel kept serving my coffee, wine and snacks on them. A friend told me that I would see the beautiful trays all over in Florence, and sure enough, I did. So I bought a beautiful gold and blue one to bring home. As I mentioned, I didn’t dig Florence, it wasn’t for me. Not every city is for everyone. If you want to take your kids to all the museums and give them a super-enriched learning experience (on vacation) and you all can tolerate that as a family, then by all means, go for it. 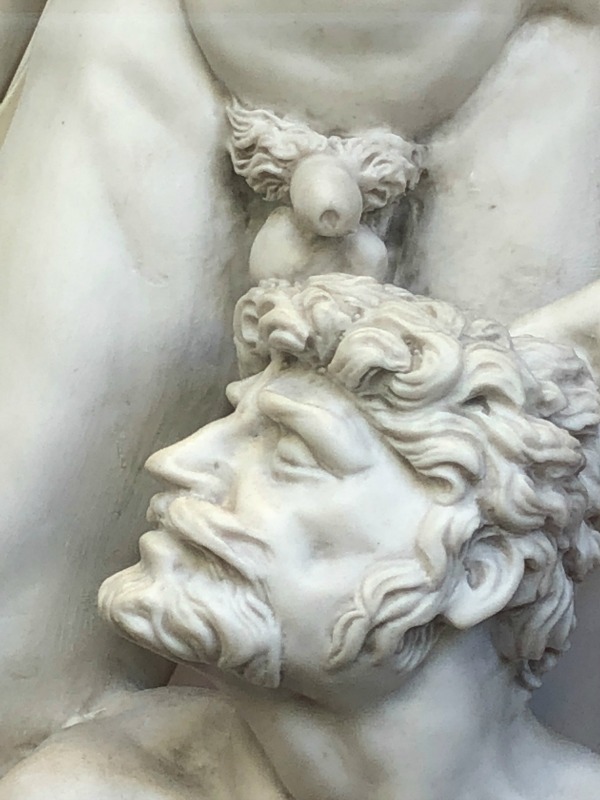 But my 11-year-old son walked around taking pictures of naked statues and sending the photos to his friends in a Whatsapp chat – #justsayin. I also realize maybe I should have taken a walking tour. Or have done a bit more research to find the things I like when I go to a city, so I might have also failed in some of my planning. But I also like to just show up and see where a place takes me. I hate being on a jam-packed schedule, that type of traveling is not for me. 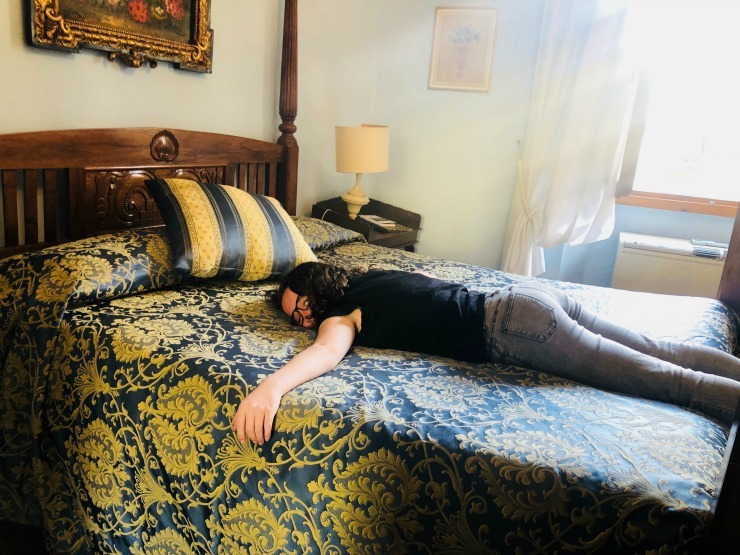 We also just came from a spa in Tuscany that I did not want to leave, so plopping myself in a jam-packed city right from there was a bit jarring. Which is probably why I liked it up at the top of our hotel’s tower so much, we were away from the crowds and had a peaceful birds-eye view. 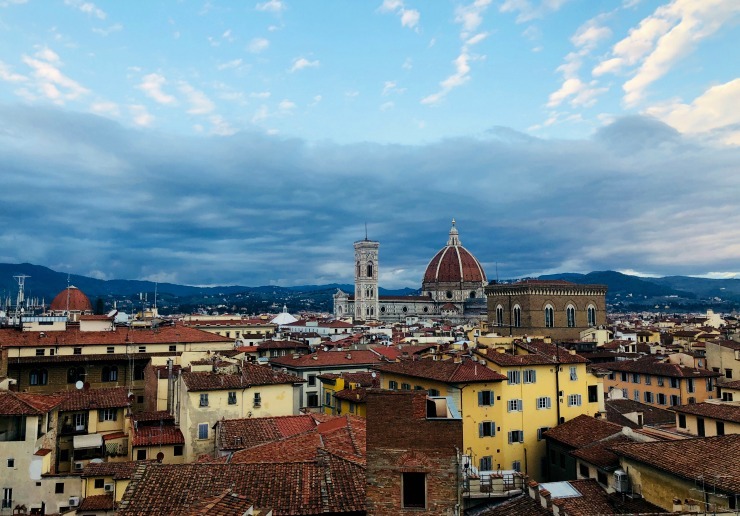 Perhaps I’ll give Florence another try… or not. Oh my. 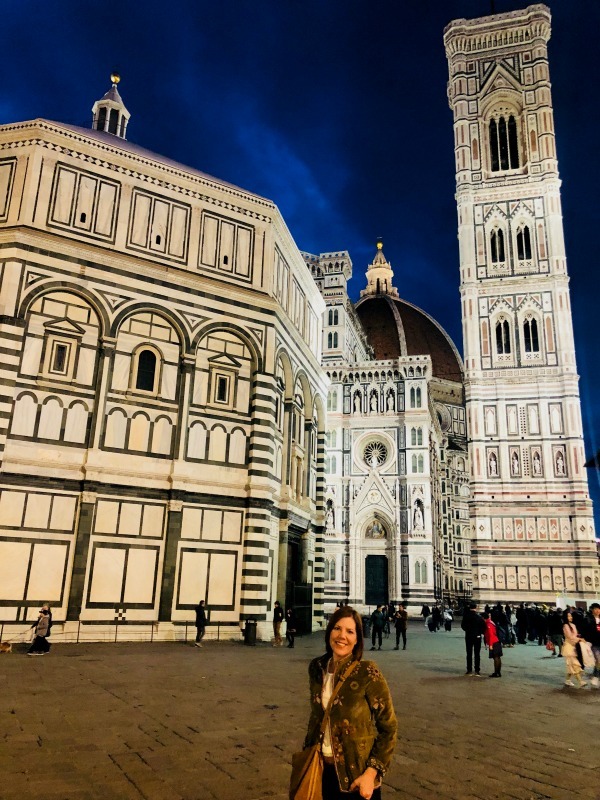 Florence was my favorite city! Not as big as Rome,super charming and so much art and history. Of course it was a mother daughter trip. I was in my 30’s and mom in her 60’s. While I also do not like a jammed-packed schedule, I do identify some activities where I can learn about a city to appreciate and enjoy its essence. A walking tour is the best way to get introduced. Hence that is what I do for a living. I offer walking tours in South Beach and Little Havana in Miami. Guests rave about our tours and always say it’s best to take a walking tour at the beginning. A little planning goes a long way. 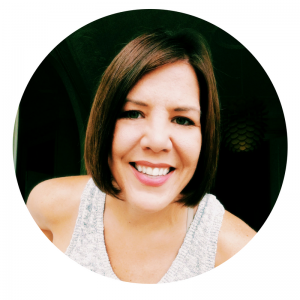 But asking a local tour guide for recommendations is the next best thing to having a local friend give you genuine insider scoop. 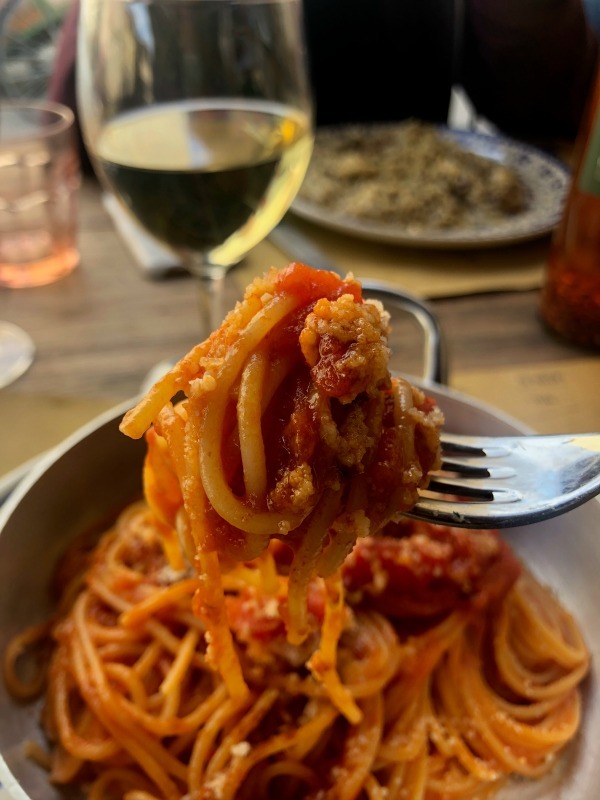 Definitely give Florence another try. Maybe without kids or when they are a little older. 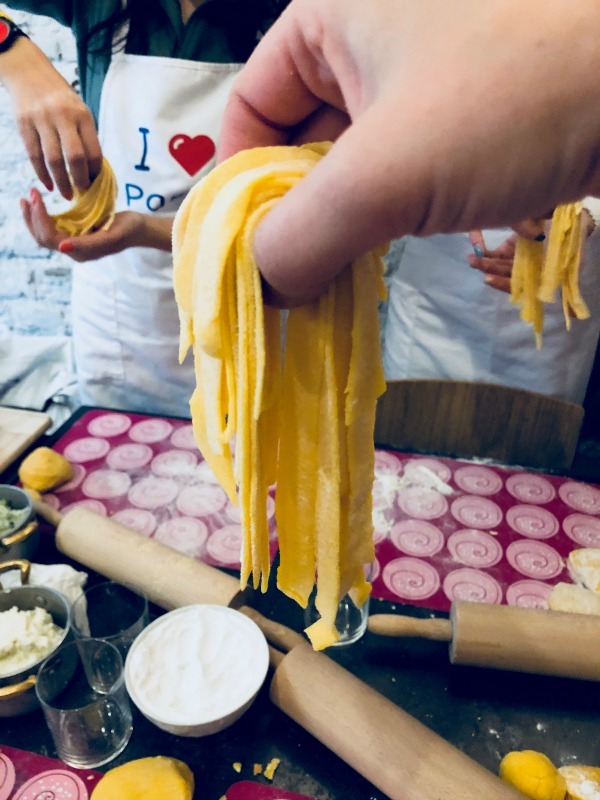 And the pasta making experience sounds like fun! Thanks Christine! Yes, I think I need to go back when it is quieter and without the children! A walking tour would have been a great idea. Your’s sound super interesting, next time I am in Miami I want to take your tour! !